Cemetery Man might be one of the most difficult movies to classify that I've ever seen. Is it a horror movie? Yes. But it's also a comedy, a romance, and an art film, and is successful in each category. I didn't see very many horror films that came out in the '90s, at least not after 1996. That's when Scream came out. I went and saw that, along with everybody else, and enjoyed it. At the time, it was a really original work. Unfortunately, its success meant that we all spent the next five years with nothing in the way of horror except for winking postmodern movies that could never just play it straight. 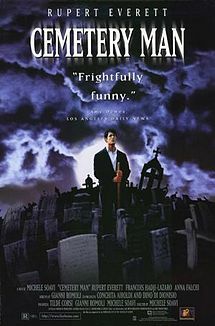 So right before I graduated college in 1997, when a friend told me about a 1994 movie called Cemetery Man, and used the adjective "clever" to describe it, it was pretty much a guarantee that I didn't want to see it. I still don't entirely know what to make of this movie's ending, but that just means I'll need to see it again. If you've seen it and have an opinion, I'd love to hear it in the comments. Despite the confusing ending, though, this was still a very enjoyable movie. I give it four revolvers out of five. hmmm, a Rupert Everett movie. . . definitelyon my list. thanks! !